I am helping my friend Laureen start a blog today. She is a certified Master Gardener in Hawaii County. It will be fun to share what little I know about blogging! At least when we are done, we can "follow" each others blog! The Hass is in the Ground! I got the hass avocado in the ground this AM. I was concerned about soil drainage, but tested the hole and drainage is very good. I added some composted chicken manure as recommended by the selling nursery. The location western but as a young tree the truck is protected by a block wall. And because we live oceanfront, there is salt in the air. These two issues have me concerned about how well this tree will thrive. So here is the first picture. I will try to update the picture every few months to show how well my first hass is doing! Accepted into the Master Gardener Program! I received my letter yesterday from the Cooperative Extension Service stating my acceptance into the Spring 2010 Master Gardener program. We start February 18 and finish class work in mid April. Certification requires 40hrs of volunteer work, 20 of which are on the phone banks. Color in the garden is here! One of my personal goals as a gardener is to apply "art" to "gardening". Obviously that includes color. I recently found this article on "Artist Got the Blues...". The colors in these gardens are a bit much for my tastes, but it is the basic concept that I like. 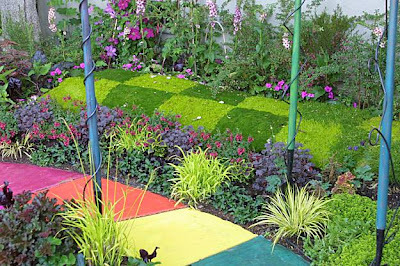 The author states she fell in love with the colors of Morocco and incorporated them into her Berkeley garden and a book. This is an interesting article from the Hamakua Springs Country Farms blog concerning a new tomato virus foun on Maui and being reported by CTAHR. MG Interview Appears to Have Gone Well!!! I arrived about 30 minutes early to my 9:30AM MG interview. I was actually hoping that they would start my interview early. Low and behold, they did, fifteen minutes early! I was asked to spend 5 minutes telling them about me. I probably talked for 8 minutes and way too fast, it was the nerves. Then they each asked me a question or two and it was over. The big hit was the fact that I had web design and blogger experience! They have a position for me! Long story short. I thought that the interview went well and the acceptance letters will go out next week. Classes start February 18th and are held Tuesdays and Thursdays from 9AM to Noon. The classes run through April with a spring break in March. I spotted the start of our first heliconia flower today! Will watch to see how long before it is fully opened. Looks like a vertical kitchen herb garden. Love it! Does Our Citrus Tree Need Pruning? We purchased this Meyer lemon tree and finally found a home for it street side of the house and furtherest away from the salt spray. Once planted two large spikes took off. So do I need to prune? One pruning site states: Prune lemons every year or two, cutting back new growth by about one-quarter to one-third. Otherwise, trees will get too large, and fruit will be hard to pick. I found this site on the internet and will probably take advice from it. 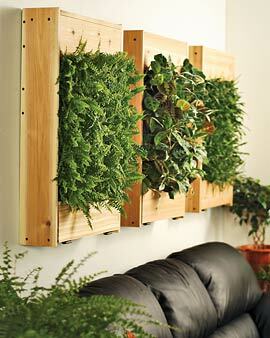 I first saw this vertical gardening concept in Sunset Magazine while visiting my sister in Arizona. I love it! Since then I have found the blog of the woman who was featured in Sunset mag. I hope to try this concept someday soon. I like to call it garden art. However, looks like it I will need a billion succulents! Just kidding, I will start small LOL. But, where to get the succulents in volume? Well, try Mountain Crest Gardens. I made a small order recently because they had "free shipping" to even Hawaii. I was very happy with the order and they gave me two bonus plants! I am scheduled for a Master Gardener Interview. Apparently this is a 15 minute panel interview. The results will determine if I am accepted into the program which starts February 2010. I am starting this blog to chronicle my journey through the Hawaii County Master Gardener program. I first heard about the National Master Gardeners from Ellen, my friend in Arizona. She is an Arizona MG as well as a degreed horticulturist from Arizona State University. And a long time friend. She inspired me to seek additional gardening experience while I lived in Arizona for over 27 years. I loved gardening in Arizona because it had three planting seasons, unlike my New England roots! I began my gardening experience as a young child in Durhamville, New York. We moved to the country and our neighbors had a home garden and many fruit trees. It was only natural that our family join the home gardening fun!